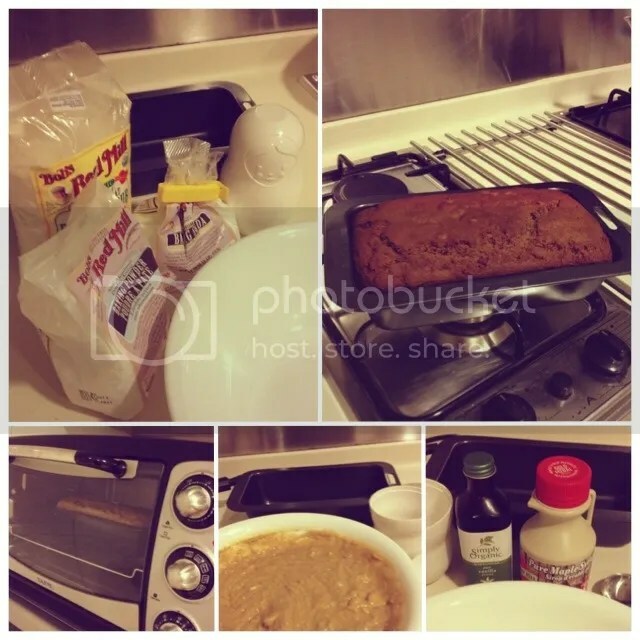 Before my next crazy experiment, I thought I go regular and make some banana bread 🙂 Also to spare my husband from more torture of eating up my strange tasting baked goods. Happy enough to get my sister and Jenna to try a slice. The texture was different for them non-vegan eaters. Without butter and eggs, the bread has a slightly crumbly feel that I reckon they weren’t use to :p It was sweet enough for them though and they could eat it if it had more banans and no nuts. That’s what I’ll do next more bananas. Then I’ll may be ready for the world!! 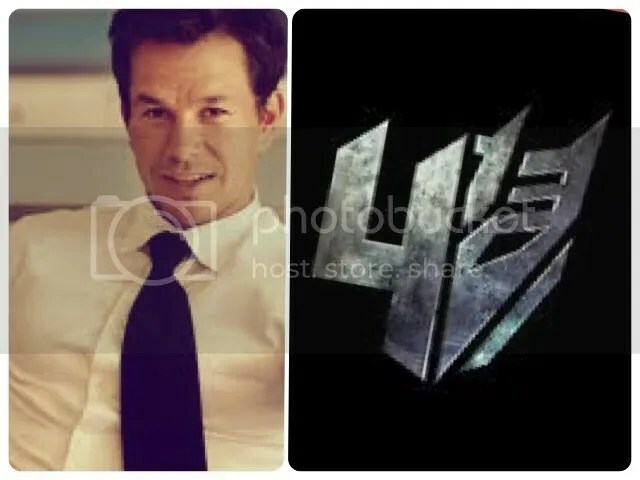 It is official, there will be a Transformers 4!! I am a happy camper 🙂 Michael Bay is back to direct it … I’m still not quite sure how to feel about that. I actually would like someone else’s take on it but talking robots with lots of action will do it for me every time. Better than a confirmed Transformers sequel is the fact that Michael Bay has confirmed Mark Walberg as the lead. I wasn’t crazy about him as a rapper, Marky Mark but as an actor he stole my heart in The Basketball Diaries, in spite of Leonardo DiCaprio being the lead :p So I’m happy happy happy that he is the action lead man in T4. I C.A.N.N.O.T. wait!! 27th June 2014 I have a date with Mark Walberg and Optimus Prime. It really can’t get better than that. The quick take, New Moon is still my favourite from the Twilight Saga and I’m still Team Werewolf. More so now than before. Bella though, looks GREAT as a vampire. I’ve never been a fan of her through out the series but I have to say I liked her in this last instalment. She was so much more interesting to watch. Spoilers ahead so if you haven’t seen it and don’t want to know, stop reading now. The visual effects though were pretty sad. Don’t get me wrong there were some really nice shots but when you have a few key shots that don’t work, it leaves a bad taste in the mouths of your audience. Then there’s a fight scene. They really should have invested some money into hiring a Asian martial arts experts to choreograph the exceptionally long scene. It was a mess and you couldn’t see who was where or what was going on. The moves were hardly graceful. To makes matters worse, it was entirely a vision. I now understand why my teachers said never write a composition where the ending says it was all a dream or imagined. It leaves worse taste in your mouth and your appetite unfulfilled. Both storytelling, no nos. All that said and done, love stories do rock and I can see why girls and women all over the world swoon over the idea of being able to be with your soulmate forever. Yes yes yes, my lunch time dates are working out nicely 🙂 Last week this time I caught up with little Miss Su. She got a little tired at the end of lunch, which explains the picture of her bundled to her Mummy who was trying to put her down for a little nap. She tried but rather go for a wander around the shop where she got acquainted with old school toys like a paper ball. After all, we were after having lunch at Old School Delights. They sell toys from days gone by and served good ‘ole goodies like Laksa, Nasi Lemak, Chicken Curry, Chicken Macaroni, Mee Siam. So what did vegetarian me have? The chef nicely did a vegetarian hor fun for me 🙂 For that, they get a thumbs up from me!! It also tasted decent. 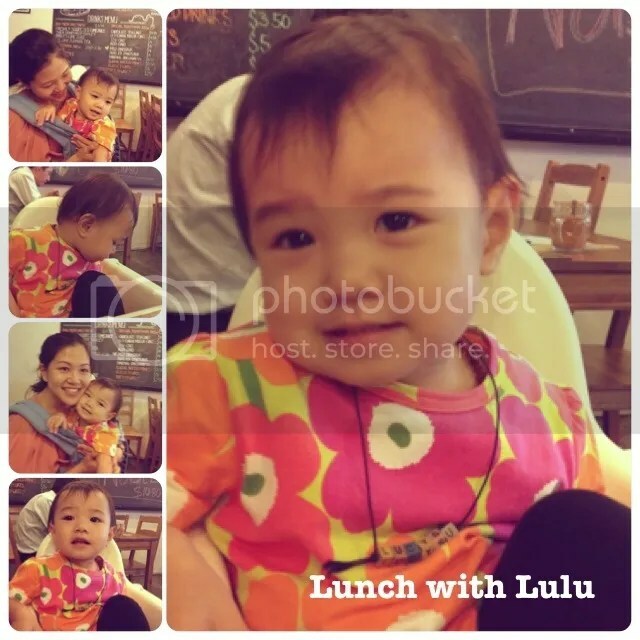 Lulu seemed to like her chicken macaroni, no eggs please with a couple of carrots from Auntie Cherry and me. We also had the chendol that was sweetened with gula melaka so in our books it was pretty authentic. I dare say it’s been nearly 2 months since I last got on the water and I paid dearly for it. The morning after I woke up all aching but looking forward to my next ride 🙂 I’m not sure why but wakeboarding does that to you. I think any activity that gets your adrenaline running does the same time. There’s something to be said about being out on the water too, especially for me. Though I wish it wasn’t the monsoon season. It was cold and rainy when we left the dock and this was my view in the boat. 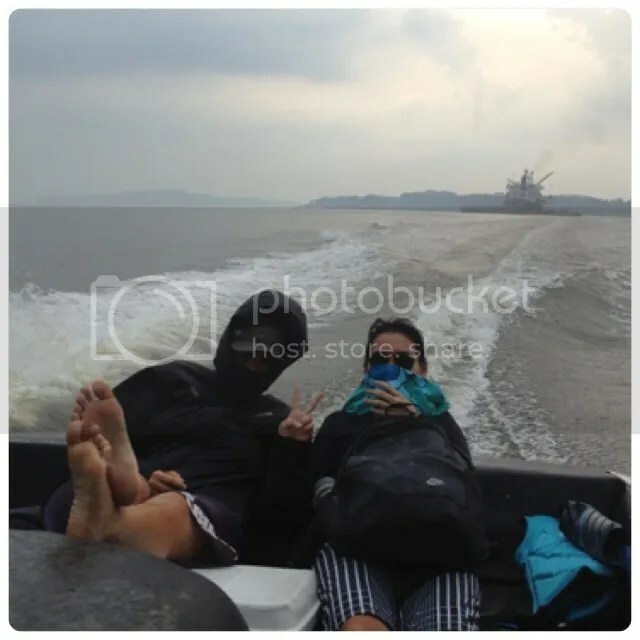 I felt like a team of terrorist going out to make an open sea attack :p The rain soon calmed down and we were out on the water. Jimbo, our instructor says we have muscle memory. Obviously he wasn’t talking about me. My muscles forgot how to edge and kinda had to relearn but pats on my back 🙂 I pretty much nailed a toeside edge!! I even tried to get in position for a jump. So maybe soon :p Meanwhile, my sister is clearing two wakes and learning to grab her board!! How insane is that? I think so too 🙂 I don’t know if I’ll ever get there but I’ll live vicariously through my sister for now. We all know what happened the last time I tried to bake with no sweetener. 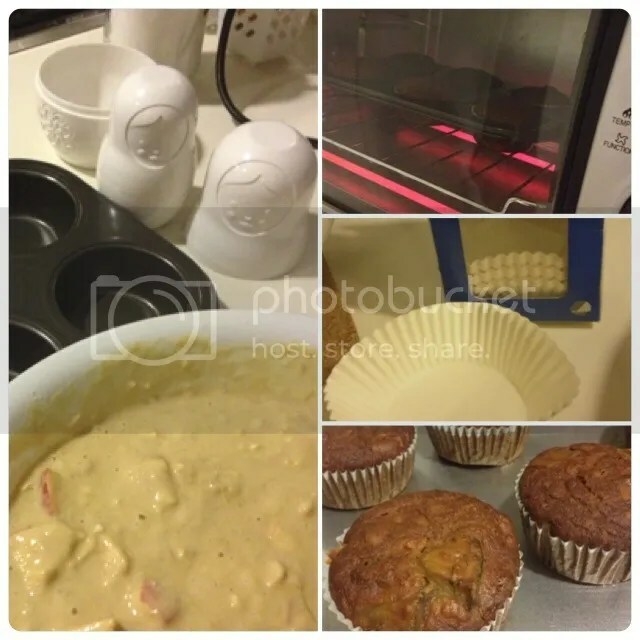 So I made sure I had ample amounts of maple syrup before I started doing anything this time 🙂 Then I got bee in my bonnet and decided to be adventurous :p My husband was trying a wheat free diet and I recently found out a friend was allergic to wheat so I decided to make gluten free muffins this time!! They looked fine, smelled great again, thankfully this time the taste was not bad but the texture seemed a little off. Vegan gluten free muffins is going to take A LOT of practice. The combination of quinoa, potato, brown rice and soya flour needs more work. I think quinoa has a taste that I’m not use to and maybe I have to learn to hide it … I’m thinking I’ll try carob vegan gluten free muffins next. 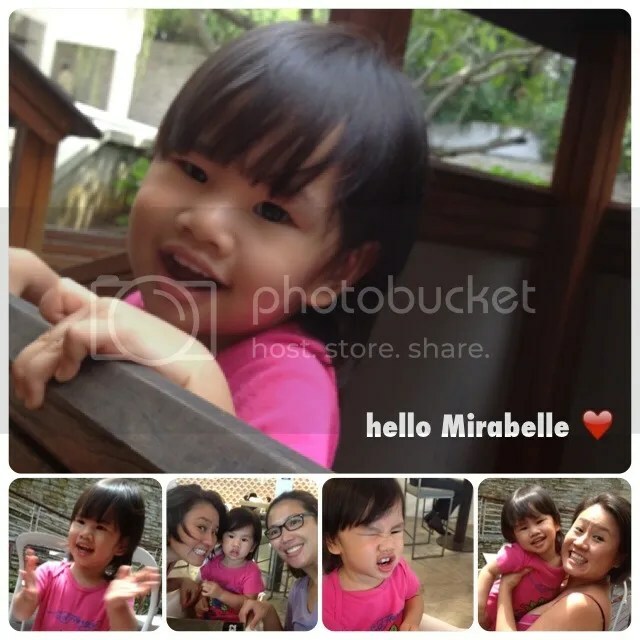 Carlene’s blog world, please meet little Mirabelle. Niece and goddaughter to my dear angel friend, Gen. The last time I saw Mirabelle, she was a tiny baby. At nearly 20 months, she definitely has her family wrapped around her little finger. She’s a cutie with a great laugh!! Godma Gen is no different from me though :p It’s boot camp mentality or it’s back home. Actually Gen and I have more in common than we realise. Lunch was at Food For Thought Botanic Gardens, which has a branch just opposite my office so I’m well acquainted with their menu. It’s veggie and kid friendly. The Botanic Garden branch is a much better location. Wider spaces and much better parking but the food is better at the Queen’s Street branch. I’ll definitely be coming back more for my family oriented outings where the kids can run free with a playground to boot. Mirabelle, her Godma and I had a whale of a time and I suspect we’ll be doing lunch again.